Toyota Fortuner, the highest selling SUV of its segment is now a direct rival to Mahindra Alturas G4. The values compared here are for the automatic gearbox variant as Alturas G4 is available with an exclusive 7-speed automatic gearbox from Mercedes-Benz. Toyota Fortuner is available with a 6-speed automatic gearbox. The wheelbase for both cars differ by a margin of 120mm, that too resulting in more legroom in the Alturas G4. The SUV from Mahindra is also the widest in its segment. The price starts at INR 26.95 lakh for the Alturas and INR 31.07 lakh for the Fortuner. Both these variant are available with a 4x2 power-train. On the other hand, the 4x4 variant for Fortuner is priced at INR 32.97 lakh. The massive Alturas 4x4 comes with an impressive price tag of INR 29.95 lakh. The top-spec model of Alturas comes with 9-airbags, 3D camera and few other segment-first features. 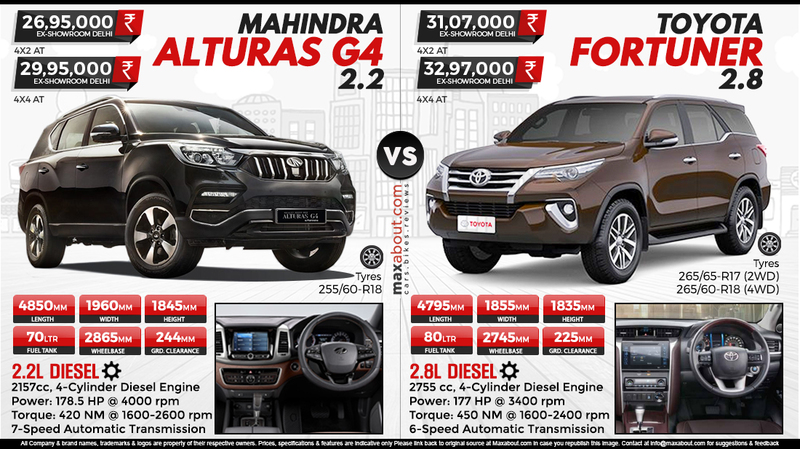 The engine size on Toyota Fortuner (2755cc) is huge in comparison to the Alturas G4 (2157cc).